Maldivian President Abdulla Yameen declared a 15-day state of Emergency in Maldives on Monday following a deepening political crisis where the President refused to comply with a Supreme Court order to release political prisoners. New Delhi: Maldivian President Abdulla Yameen declared a 15-day state of Emergency in Maldives on Monday following a deepening political crisis where the President refused to comply with a Supreme Court order to release political prisoners. This Emergency gives sweeping powers to security forces to arrest and detain suspects. 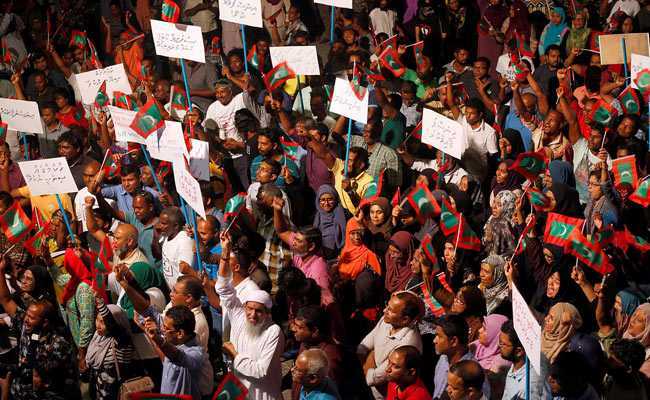 As the news of Emergency spread, a wave of protests broke out in the capital Male, with angry clashes between police and demonstrators. The government, however, maintained that Emergency was enforced for welfare of citizens. "The state of emergency was enforced in order to protect the peace and welfare of all citizens and the country," Presidency Maldives tweeted. The Maldivian Supreme Court had last week ordered the immediate release of former president Mohamed Nasheed and other opposition leaders. The Court had also ordered the government to restore the seats of 12 legislators sacked for defecting from Mr Yameen's party, giving the opposition the majority in the assembly which would mean that they could potentially impeach the president. President Yameen refused to comply the top court's orders, despite growing international pressure and concern, leading to declaration of Emergency in Maldives. Immediately after the Emergency was declared in Maldives, the Ministry of External Affairs (MEA) advised Indian nationals to defer all non-essential travels to Male and other atolls until further notice. It also urged Indian expatriates in Maldives exercise due caution in public and avoid public gatherings. China and the United States also issued travel advisories for Maldives. In a series of tweets by Presidency Maldives, the government assured safety of tourists and Maldivians. It tweeted, "Safety of foreigners living in and visiting the Maldives will be ensured." Following the Emergency in Maldives, Exiled former Maldivian president Mohamed Nasheed on Tuesday urged India to "act swiftly" to help in resolving the ongoing political crisis in the island nation. Soon after the Emergency declaration, security forces stormed into the Supreme Court building, where Chief Justice Abdulla Saeed and judge Ali Hamid were arrested on Tuesday. The charges against them have not been specified. This dramatically escalated the legal battle with the Maldivian top court. A day before the Chief Justice's arrest, Maldives police arrested President Yameen's estranged half-brother and former president Maumoon Abdul Gayoom, who was president for 30 years until the country's first democratic elections in 2008. Mr Gayoom had sided with the main opposition and was campaigning against him. As the crisis escalated, the United States National Security Council said in a tweet, "America stands with the people of Maldives and the Maldivian government and military must respect the rule of law, freedom of expression and democratic institutions. The world is watching." The Maldives is made up of 26 coral atolls and 1,192 islands. Politics centres on the tiny but densely populated capital Male. The tumult comes during the peak tourism season in Maldives, a country of 400,000 people, best known as a "beach paradise" for the tourists.